On July 8, 1816, Jane Austen began Chapter 10 of volume 2 of Persuasion. On the final page of Chapter 11, she marked "Finish July 18, 1816". In Austen's "original" ending, Captain Wentworth does not openly express his love for Anne but instead requires persuasion to do so due to his fear of Anne's rejection. In the most simple terms, there is NO LETTER! Can you imagine, for even a minute, the tragedy of NO LETTER from Captain Wentworth?! Unsatisfied with the ending to her completed manuscript, Austen rewrote the ending at some point between July 18-August 6, 1816. According to Austen's nephew, James Edward Austen-Leigh, Austen thought the original ending to be "tame and flat", "awkwardly managed" and "clumsy". The cancelled chapter is the only manuscript from any of Austen's novels that exist in original form. 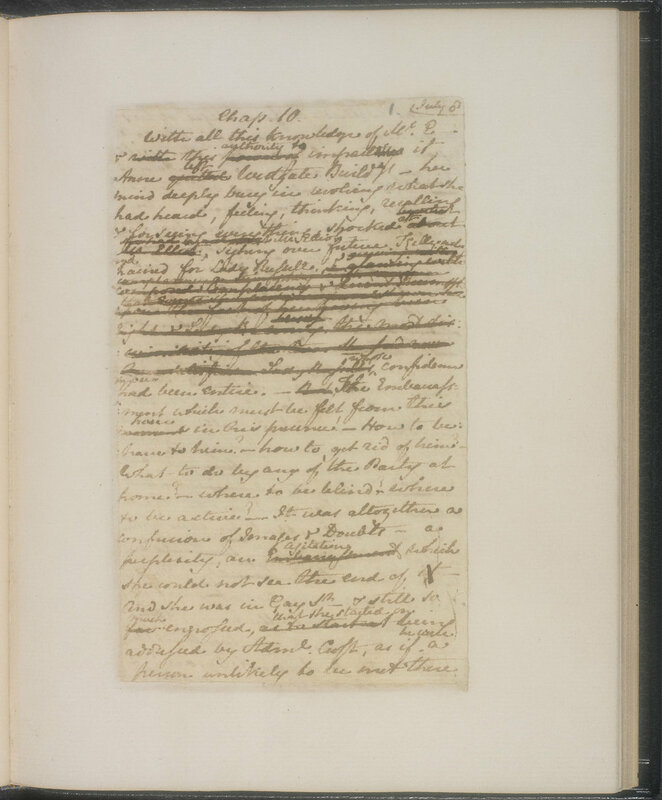 The photo above is of the first page of Chapter 10 (isn't it amazing to see Austen's personal handwriting with the mark-outs, modifications and re-writes!). Fortunately, Austen's revised ending of Persuasion (which contains Captain Wentworth's bold, profession of love for Anne in his letter), was the ending chosen for publication in the novel. Thanks to Austen's ingenuity and desire for perfection, Captain Wentworth's love will be memorialized as he writes to Anne, “You pierce my soul. I am half agony, half hope. Tell me not that I am too late, that such precious feelings are gone forever... I have loved none but you.” Captain Wentworth's vulnerability is rewarded by Anne's acceptance of his love which ultimately elevates Captain Wentworth's character to meet the depth of Anne's. In my opinion, Austen's revised ending is superior to the original, immensely satisfying and altogether perfect in it's own right. What do you think? 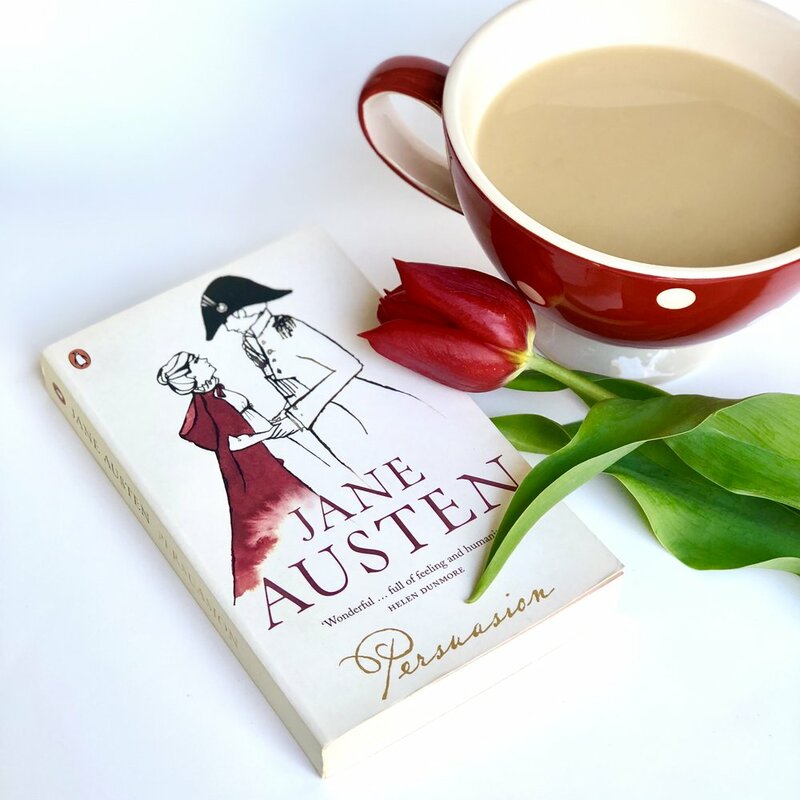 Persuasion’ was the final completed novel of Austen’s illustrious literary career. There is discussion among scholars that Austen may have had plans to further revise and edit it due to its relatively short length (in comparison to her earlier works) and also to further develop the relationship between Mr. Elliot and Mrs. Clay. In my humble, Austen-loving opinion, no such revisions are necessary! She, once again, delivers an outstanding fictional account of real English life in the early 1800’s. Described as a “novel of manners”, Austen satirically addresses the “excess” of English society while also maintaining support of “necessary” structure and balance. In addition to the theme of persuasion (as demonstrated internally within individual character development, between two in a relationship and also society-wide with the pressure to conform), we also see previous themes such as pride (Sir Walter, Elizabeth), prejudice (Lady Russell, Mary), sense (Anne and Captain Wentworth - first half) and sensibility (Anne and Captain Wentworth - ending). Austen also addresses the role of the “gentleman” (Sir Walter and Mr. Elliot versus Admiral Croft and Captain Wentworth), class structure and social mobility both upward (marriage and the military) and downward (Mrs. Smith and the debt of Sir Walter). What are your thought on ‘Persuasion’? Do you think any revision was necessary and/or would have been made by Jane Austen if she lived longer? I can’t wait to hear what you think!